THE PEACHIEST OF GIVEAWAYS - ALL 60ML OF IT! From Egoist, one of the best flavorcrafters out there! The winner of the lottery #1026 for THE PEACHIEST OF GIVEAWAYS - ALL 60ML OF IT! was Maik Hasel from Duesberg, Germany on Sep 12, 2018. Peachy vanilla ice cream - need we say more? Ok ok, let's say more but that's only because we love you! 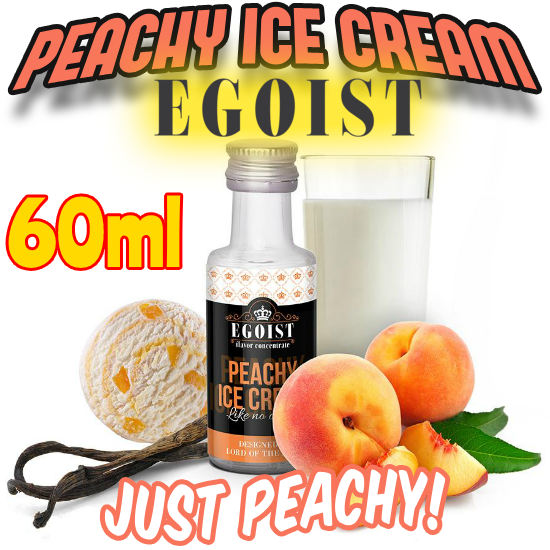 Egoist's Peachy Ice Cream is guaranteed to blow you into next week with an unreal taste and feel unmatched by any other peach ice cream flavor. No joke, we are vapers ourselves and have vaped everything from cactus to cavendish but this guy right here is where the buck stops - full stop!